When foods are grilled on a BBQ they are often subjected to a few dangerous assaults such as being heated at very high temperatures, touching the grill residue from previously used grates, flammable fluids to start briquettes, and rising smoke. All of these things bring health risks. Meats that are heated at high temperatures experience hazardous changes in structure. The amino acids (Protein molecules) in the meat react with creatine to form heterocyclic amines also known as HCAs, which are thought to cause cancer. Grilling also exposes meat to cancer-causing smoke that rises from dripping fats and juices. These fumes are filled with toxins. The longer the cooking time the more heterocyclic amines are formed. Research is proving that those consuming larger amounts of red meats and those heated on grills at high temperatures that give that “charcoal” affect have higher incidence of stomach and colon cancers. Limiting red meat consumption is smart. So cut back on foods like steaks, lamb chops, hot dogs, hamburgers, and skewered meats. Try to limit yourself overall to no more than three – six ounce servings per week. What else can you do to eliminate some of the risks involved in enjoying an upcoming BBQ? Definitely have the fat trimmed from your meat or buy meat that says it is “lean.” When fat drips onto charcoal briquettes it causes polycyclic aromatic hydrocarbons (PAHs) to form, another carcinogen. Clean the grill after and before each use. Just take a steel wire brush made for cleaning grills and go over it until all charred residue is removed. Eat more fish and skinless chicken at the BBQ party. Oil the grill to keep charred material from sticking to your food. Use good oil such as extra virgin olive or something more tolerant to heat such as grapeseed oil. Just wipe it on with a brush before grilling begins. Pre-cook your meat, poultry or fish in the oven for two to five minutes then finish on the grill. 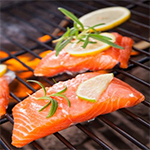 Less grill time means less cancer risk. Use a marinade! Marinating foods overnight or even for a minimum of one hour prior to grilling will help reduce the level of HCA being produced. It also makes food more tender causing meat to need less grill time in general. Cut foods into smaller pieces whenever possible to reduce cooking time. Fill up on veggies like corn, salads, tomatoes, celery and other savory additions to the meal. Remember to leave the skins on vegetables being cooked on a grill. When eating a wide variety of foods and consuming all sorts of beverages as we may do at parties, it is important to remember that your digestive system will be more stressed. Try to remember that every food one consumes requires enzymes to facilitate digestion. © 2013 Nature's Sources, LLC. All rights reserved.